We first meet the Mirabal sisters as girls on a carefree afternoon chasing butterflies in the garden of the family’s country estate in the Dominican Republic. Patria (Elisa Gonzales) is the serious one who aspires to a pious life. Minerva (commandingly played by Jacqueline Grace Lopez) is a firebrand with her sights set on becoming a lawyer. Dedé (Sandra Ruiz) wants nothing more than to be married. And the baby of the group, Maria Teresa (engagingly portrayed by Maxitxell Carrero), covets fancy dresses and copious pairs of shoes. Scenic and projection designer Ian Wallace brackets this garden setting with dramatically tall walls arrayed with items covered in whitewash: plantation shutters worthy of hurricane-force winds and ill political winds, clothing without owners, a bicycle from an idyllic time of innocence, a straight-backed chair present at an interrogation. All appear stuck to the walls by tropical humidity. The layers distort projections of the real Mirabal sisters and other historic individuals giving them a fractured, ghost-like appearance. But wait. Why are there five actresses present? There are in fact, two Dedés on stage. 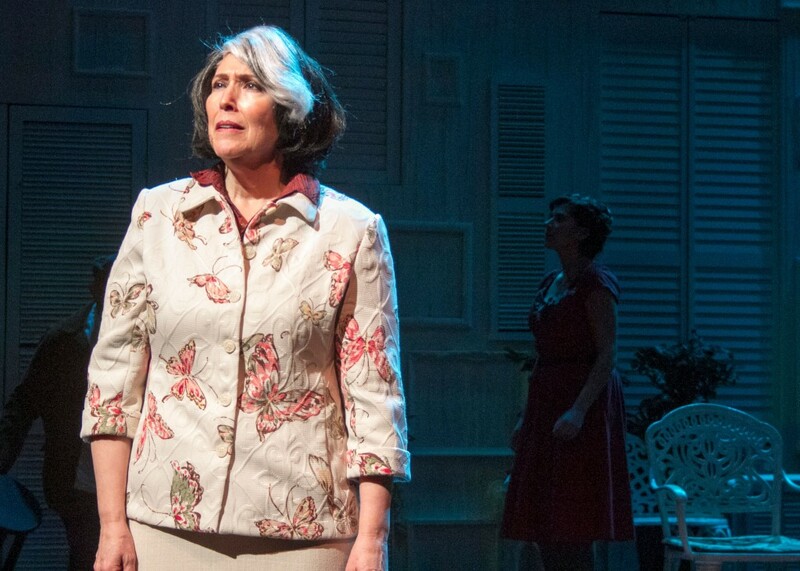 A melancholy Older Dedé (Catalina Maynard) stands apart watching her younger self and sisters. In later exchanges with a nameless American writer (double duty by actress Sandra Ruiz), Older Dede provides historic background and narration of coming events when the sisters dare to stand up to Generalissimo Rafael Trujillo (Herbert Siguenza, in a chilling portrayal), who brooked no opposition during his stranglehold on power. Alternating scenes — between past and present — is rocky in places, particularly when a DJ (Siguenza, again) pops in with dance moves and era-appropriate music to signal a new decade. What does come through loud and clear is the sisters’ iron-clad loyalty to one another. Times are perilous as the sisters enter adulthood: Rebuking a sexual advance by Trujillo (as Minerva does), writing too candidly in a diary, or simply possessing a letter from someone considered politically undesirable leads to dire consequences. In response, the sisters form an anti-government resistance group and collectively operate under the code name las Mariposas (the Butterflies). The one-act script lacks sufficient detail as to the extent of their activities beyond holding clandestine meetings and hauling grenades in backpacks. Two acts may have served the story better. Eventually, the Butterflies become an intolerable threat to Trujillo, who gives the order to swat three of them out of existence. But the blood of this action only serves to seal both Trujillo and Dedé’s fates. El Jefe is assassinated six months later; Dedé spends the next 50 years as keeper of the flame, telling and retelling her sisters’ tragic story as she dwells within the same garden walls of their youth, where butterflies continue to take wing. 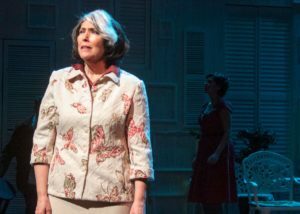 The San Diego REP staging is the first English-language production of “In the Time of the Buterflies.” Playwright Caridad Svich, a UCSD Theater MFA and winner of a 2012 Obie Award for lifetime achievement in theater, took her inspiration from author Julia Alvarez’s international best-selling novel of the same name. Costume designer Anastasia Pautova gives the ladies trunks-full of festive and sophisticated styles befitting their society-focused life during good times. Many outfits incorporate subtle butterfly patterns in the fabric. When the women become revolutionaries, full skirts give way to cargo pants and muted colors. The production is co-directed by Todd Salovey, San Diego REP’s associate artistic director, and Herbert Siguenza, artist in residence. As a cast member, Siguenza wears more hats than normally found in a haberdashery. In addition to the DJ and General Trujillo, Siguenza portrays the Mirabal patriarch, a fellow revolutionary named Lio, and an ill-fated Jeep driver named Ruffino.